In the Women’s Library collection is Millicent Garrett Fawcett’s personal scrapbook, full of mementoes. 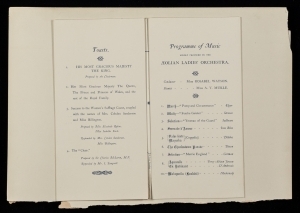 Near the beginning is a programme for this dinner entitled “complimentary banquet for suffragists”. The item is interesting for a number of reasons. 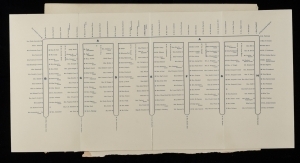 250 people attended the banquet with their names listed on the back of the programme and a seating plan in the centre. It reads like a suffrage who’s who. Suffragettes and suffragists sat alongside each other and this is one of the few recorded examples of this happening. A Daily Mail reporter sat near the top table. All were called ‘suffragist’: the Daily Mail reporter commented that Millicent would have none of the word “suffragette”, a term that had only been coined by the Daily Mail that year, as the women were all still part of the same movement. Millicent outlines her reasons for hosting such a banquet in a private letter. Although the “work of quiet persuasion and argument” created a firm basis, she acknowledged that the suffrage campaign had received “a great impetus from the courage and self-sacrifice” of the suffragette prisoners and that they had “touched the imagination of the country”. For this reason, a small committee organised a banquet for them on their release from Holloway. In October 1906, Emmeline Pankhurst, Charlotte Despard, Mary Gawthorpe, Annie Cobden Sanderson and others, went to the Central Lobby of the House of Commons and caused “a disturbance”, waving flags with the words “Votes for Women” and standing on padded seats, voicing their demands for women’s suffrage. Annie Cobden Sanderson was arrested along with three others. The arrest of Annie brought much publicity as she was the daughter of Richard Cobden, founder of the Anti-Corn Law League. 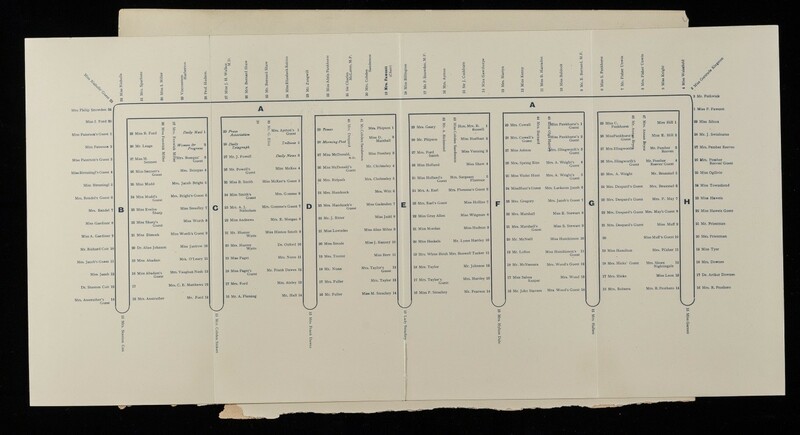 Annie had married Thomas Sanderson, arts and crafts designer and founder of Doves Press, and on marriage, they joined their surnames, like Emmeline and Frederick Pethick-Lawrence. On hearing the news of Annie’s imprisonment, Millicent sought permission to see her in Holloway. Millicent wrote about this visit in her autobiography, What I Remember. First, she was shown different parts of the prison: a prison cell, the chapel, the infirmary. She then saw Annie who was dressed in prison clothes. Annie was a vegetarian and her diet consisted of three potatoes until the doctor recommended two ounces of butter daily. “That makes an enormous difference,” Annie told Millicent. LSE Archives holds Annie’s prison diary which describes prison food in some detail. It also mentions Millicent’s visit. This is the front cover. 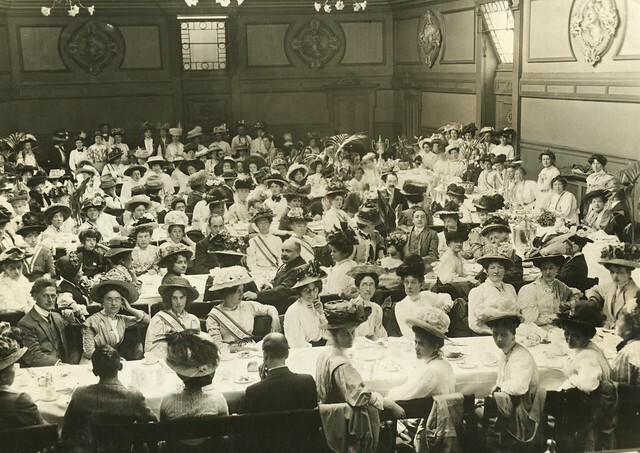 There are no known photographs of this banquet but it would have looked something like this one for suffragette prisoners at the Queens Hall in August 1908. The Daily Mail report commented on the speakers. Millicent, as toastmaster, referred to as “Madam the chairman”, was dignified wearing a sparkle of rubies and diamonds at her neck and shoulder and a bunch of lily of the valley on her dress, all in the suffragist colours (the suffragette colours of purple, green and white would come in 1908). He also mentioned the excellent dinner with only six bottles of champagne being consumed. 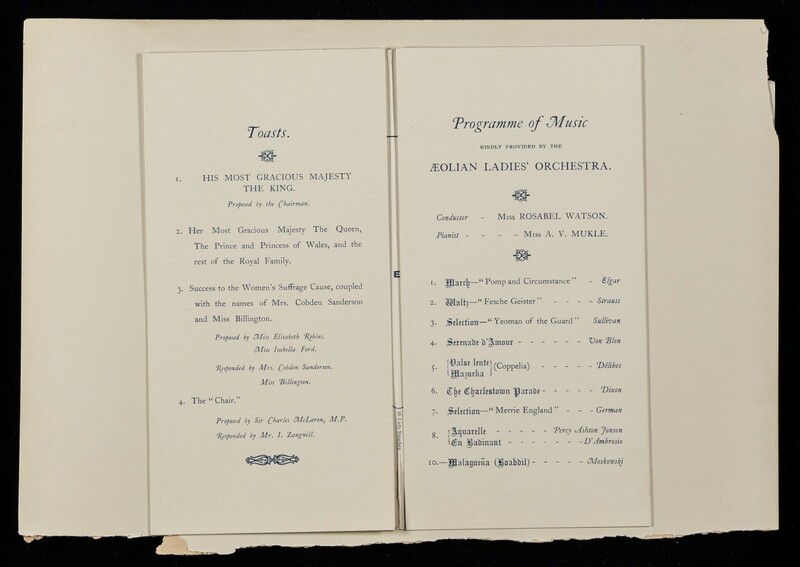 He omitted, however, to mention the Aeolian Ladies’ Orchestra who performed at the event, with Rosabel Watson conducting and May Mukle on piano, surprisingly, to a programme of all-male composers. Millicent notes in What I Remember that, although the banquet was a success, she received much criticism for organising it, even from her own society, the National Union of Women Suffrage Societies. What prompted her to produce such a public act for her friend, Annie, and the other released prisoners, was how they had been misrepresented in the press. 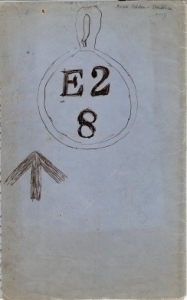 Millicent Garrett Fawcett’s scrapbook is quite fragile and we have digitised it for you to look at.